Electrodes are used in electrical discharge machining (EDM) for manufacturing desired shapes from metal that can’t be used with traditional machining techniques. In an EDM machine, a series of rapidly recurring current discharges between two electrodes, the tool-electrode and the workpiece-electrode, creates tiny plasmas zones that melt and remove material. Electrodes in an EDM machine consist of highly conductive and/or arc erosion-resistant materials such as graphite or copper. They can be rods or tubes, multi-channel or single hole, and can vary along all dimensions. 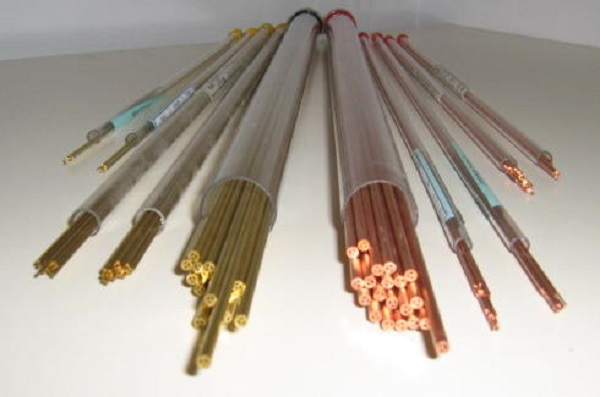 Electrodes for small-hole EDM machines, or “hole poppers,” are normally either brass or copper and are material used to make a hole in the material. The type of hole varies by electrode. They can either be a single hole diameter that has no other internal walls or a multi-channel type internal hole with multiple walls throughout the length of the electrode. One of the main variations between electrode types are whether they are a single hole diameter or a multi-channel electrode. An electrode’s intended performance depends on the type of hole going through the center of the electrode, as different channel types are made of different purposes. A single hole electrode is named for its singular, empty hole diameter. There are no other internal walls within the electrode. They are used primarily for hole burning applications that require a hole to be drilled entirely through a part or material. Because they do not use any internal wall, they require less material to make and are usually less expensive. Multi-channel electrodes are designed with internal channels that are used to drill blind holes and burn away excess material at the bottom of the hole. Because of the internal walls, as the electrode spins, it affects every part of the workpiece, leaving no material at the bottom. Two and Three Channel: Depending on the size of the electrode, it will need a different number of channels for greater structural integrity. If the external diameter is larger, it will have three channels. Wire Inserts: These are inserted into single hole electrodes to make them function similar to a two or three channel electrode. They burn away more material than a single channel. Y-Type and Web Type Electrodes: These electrodes are similar to the two and three channel electrodes in purpose and design, but they use less material and more flushing. McWilliams Sales & Service is your source for quality EDM equipment, parts, and consumables. We can supply all of your EDM consumables for all makes and models to meet your application need. To learn more about our EDM electrodes and to find the right electrode for your EDM machines, contact us today.